There is a lot more reaction around today from our weekend win, but I'll start with some developments off the field. 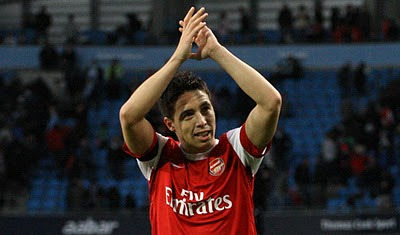 Arsenal are set to offer Samir Nasri a three year contract extension according to The Guardian. The midfielder is into his third season with the club and with his four year deal set to expire in the summer of 2012, now is the right time to be tying him down to a new deal. After a consistent first season of adapting to life in the Premier League, we didn't get to see the Frenchman at his best last season, after his leg was broken in a pre-season challenge by Abou Diaby whilst the team were at their training camp in Austria. However you could see what an amazing player he was when he scored what arguably was our goal of the season in the Champions League against Porto. After an excellent start to the season, Nasri has seven goals from nine starts. "I think he has become stronger and you judge a player by his 'numbers': yesterday he had a goal and an assist. That's what you want from players who have a lot of talent like he has. "He is quite a complete player because he can run with the ball, he is quick and he is a clinical finisher now. I believe we have a great player in him now." It's just rewards for a player I consider to have been one of our best performers so far this season. Meanwhile the Daily Mirror says we'll also be discussing a new deal with Andrey Arshavin. Captain Cesc Fabregas has been planting his feet firmly on the ground following our win at Manchester City and quite rightly to in my opinion. "It is just one more game, let's not get carried away. "The time to talk about if we have matured or are better than before will be at the end of the season. "In football, you know what people will say when you win, and you know what people will say when you lose. "You just have to keep focused on what you do, in training and in the game, give everything for the team and the rest is not up to you. "We have a very good team, with lots of young players. We have to make it a great time by winning things." The problem is that there is an over reaction to every win and every defeat. When we win we're going to win the league but then when we do lose people say we won't finish in the top four. Fabregas is right to keep his team mates feet grounded. We've won at Manchester City. Lets move on to the next game. Football is a results driven sport. You're only as good as your last win, so lets keep up this winning run until the end of the season. The Mirror Football website also carries a piece about Cesc's comments made after the game about the "15 players" articles saying he's backtracked on what he said. In fact he was clarifying what he'd been interpreted to have said. I thought at the time the comments were a bit cocky and that not at all like Cesc. So was pleased he tweeted what he did yesterday. One thing I noticed on reading Andrey Arsahvin's post match interview with his official site is the line about the Russian shouting at Cesc in his mother tongue and the Spaniard understanding and passing him the ball. The Sun have a rather witty piece on the whole episode. Elsewhere Nicklas Bendtner is talking about his return to first team action at the weekend. "I'm pretty sure I'm going to come back stronger but we'll find out in what way exactly. "All I can say is that I feel sharper than ever, which was always the plan, and I can't wait to get going properly." It will be interesting to see where Bendtner fits into Wenger's plans for the season. Obviously he's got a big future ahead of him but I doubt he'll be first choice this season. Chamakh's nailed on for the focal forward position, with the support of Arshavin and Nasri with Walcott waiting in the wings as well. From what I've heard Bendtner is not concerned by the arrival of Marouane Chamakh. He speaks highly of him in the interview with the Daily Mirror, but from the whispers I've been hearing does not think the Moroccan is not a threat to his place in the first team. Now we all know he's arrogant and certainly thinks highly of himself. But to dismiss Chamakh's impact on the team and to think once fit he'll walk back into the team is another thing. Baring injury to the Moroccan, I fear Bendtner will spend quite some time on the substitute's bench this season. Lukasz Fabianski has been talking about a moral boosting away day clean sheet. "I'm just happy that I could help my team and that I could keep a clean sheet for the first time this season. It wasn't really about me. "I'm happy that we kept a clean sheet as a team because in the last few games we hadn't been able to do that. "I think we are all pleased with that and keeping a clean sheet helped us get this ­important win." He played very well at the weekend. Likely to be rested against Newcastle. But he needs to continue with these solid performances to silence the doubters. Amazing how all this talk of a new goal keeper has quietly disappeared after each encouraging performance Fabianski has made. Finally for today, former referee Graham Poll has been going through the number of penalties and red cards we've been given in the Daily Mail.